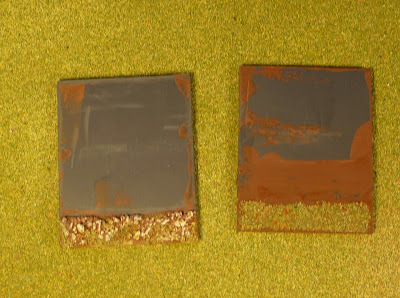 Most people who follow this blog know that I have a pretty idiosyncratic basing scheme. 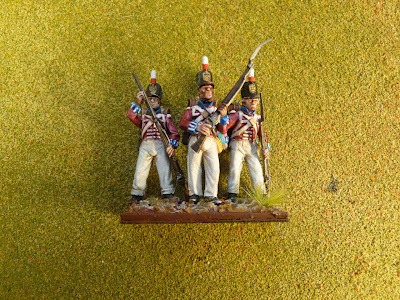 I put three 28mm figures on a 40x20mm base in single rank (slightly staggered if possible). I do not believe that I have seen anyone else do this, but it works for me and more importantly it works for the 2 games that I play: Field of Battle and Lasalle. I have laid out my reasons for my method in a previous blog, but suffice to say I started up my wargaming with a plan to build the two sides at the Battle of Fuentes de Oñoro at a 1:40 ratio figure man ratio and felt that it would be best to use a small as base as possible. I am actually about a third of the way through my master plan having finished a corps aside, which I believe to be a pretty good pace over 3 years. There have been and continue to be distractions, like Walmoden's Korps, Calpe Prussians and now Austrians as well as several new rulesets. 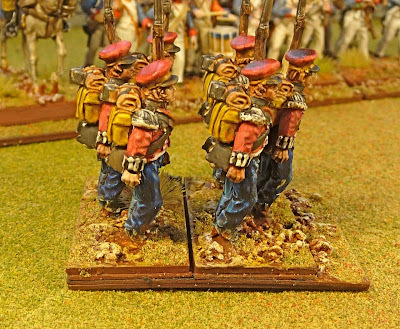 I always realised though that I liked the look of "big battalions" and as noted in my initial blog entry on basing, my bases were designed so the battalions could be easily doubled in size allowing play with 1:20 ratio rule set like Général de Brigade. Well, it is not GdB that we are interested but the new rule set Republic to Empire. I am quite keen to give these rules a go, but this set unlike FoB and Lasalle appears to require much larger battalions than I have painted to date. I do have a lot of figures painted (well over 1000), so it is should be pretty easy to chase up the 10-15 large battalions that are required in RtE. 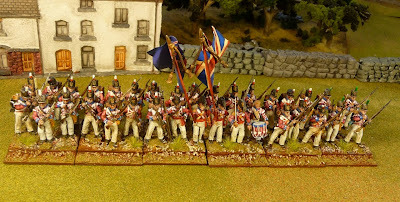 Although the rules allow for variable sized battalions anywhere from 16-56 figures, generally the average French battalion is 24 figures and the English 32 figures. In my plan for RtE, I wanted to use the same figure manufacturer within each battalion and additionally had to adjust for the fact that early in my painting career I foolishly bought figures in a firing stance that are great for vignettes but difficult to line up in column of march. I also was not keen to have to move 12 bases for a single battalion, so I had to find some transient method of basing that uses a sabot. 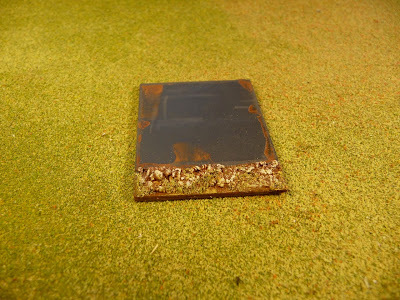 My present bases are fortunately quite thin, 1mm hard plastic, so I had some flexibility. Everyone appears to rave about Litko bases, so I thought I would have a look. They have a lot of different products but what caught my attention was their flexible metal and magnetic sticky bases. I also needed something to stick the sticky strip on and their 0.8mm plywood bases were perfect. We already have enough problems in 28mm gaming with vertical scale. 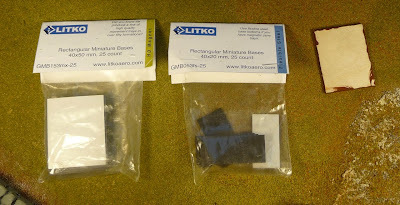 I am not really keen on thick bases, I find the 3mm Litko bases already a little too thick. So here we have a 40x20mm 1mm plastic base with a precut 40x20 sticky flex steel base attached, still pretty low profile. Bit of paint and we are done. I then made a sabot out of a 40x50mm 0.8mm plywood base with a the same sized HD flex magnet base stuck to it. I initially tried the regular strength magnet, it would not hold metal figures. As you can see it has a pretty low profile as well. I went with an extra 10mm depth to make it possible to mount all those firing pose figures I have. I am trying 2 different terraining techniques, clearly the one on the left looks better, but I wanted some sabots that had terrain with no relief so I could stick on labels to indicate the unit designation and it's stats. I just find it hard to read the flags and the facings in a game. The magnetic strength was quite satisfactory for plastic figures, but would it work for metals? Here are some Perry metals. Seems to work.......but how about the big boys? Here are some chunky Front Rank........success! Here is a 30 figure British battalion. The unit sticker will be affixed to the command stand. and a 34 figure battalion. A 24 figure French battalion. Not sure if I really need to use a sabot for the mounted officer base. A 34 figure French battalion. So generally I am pretty pleased and believe the scheme works. I have photographed the sabots from their worst angle. On the table looking from above they look pretty good. With the sabot the base is around 3mm thick. I know, of course, that rebasing would look much better but I believe the solution is not too bad. 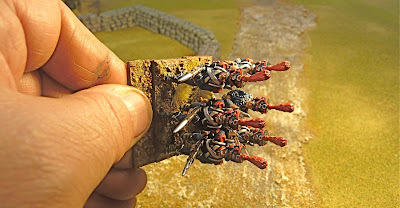 I use Litko magnetic bases also for my 28mm Napoleonics. I've been very happy with the product. 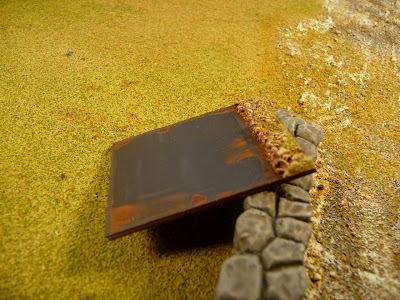 I like how you've incorporated your old basing system into a new one - that's both very clever and very practical. Welcome to the world of big battalions! 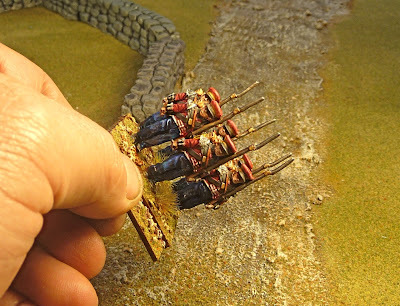 John - I'm glad to see others are trying different basing/movement tray systems - you've got great results - I particularly like your Victrix French. I found some old magnetic boards from a kids game - tossed the old magnet figures away and will now plan to cut the boards up to fit battalion sized units. Just hope I get the same degree of adhesion you've managed to achieve with yours! Thats an excellent solution, looks very good. No doubt the big battalions look impressive too. I like those Perry Hanoverians, I plan to use some of those. Inspirational stuff, keep it coming! Neat idea John, nice work!